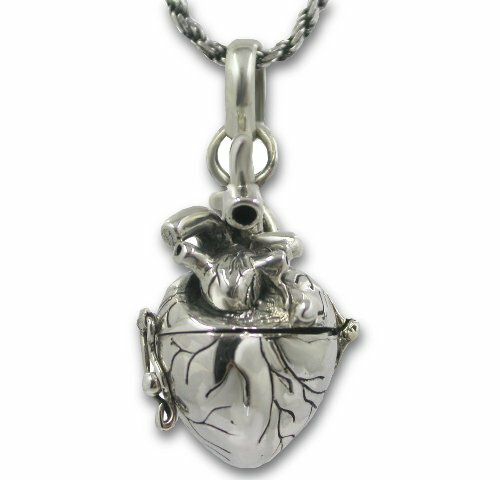 Gorgeous Sterling Silver anatomical heart necklace, can be used to hold a message, carry your medication or special souvenir. your choice of vegan leather braided necklace with sterling clasp in various lengths or solid sterling silver rope chain in 20" or 24"
Pendant 1.2" (28mm) tall x.8" (18mm) wide opens to fit Medication or Souvenir. Compartment will fit 6 small Asprin pills comfortably. Your choice of vegan leather chain 20",22",24" with sterling silver Clasp OR Solid Sterling silver Rope chain. If you have any questions about this product by CoolRings, contact us by completing and submitting the form below. If you are looking for a specif part number, please include it with your message. Sterling Silver Extra-Large Engraved Oval Locket Necklace, 22"